Sharing traditions, one recipe at a time! Buffalo wings are addictive, but for those watching their weight, we’ve got an alternative that may have you rethinking which you like better! Grilled Buffalo Cauliflower Florets have all the flavor, a nice crunchy bite, and are totally delicious. The perfect low-calorie option! Cauliflower florets are a natural substitute, giving you a texture that is surprisingly pleasant and the perfect foil for any sauce you like. If you have vegetarians coming to any of your parties, these are always a winner. My version of the buffalo sauce has a little brown sugar in it, helping cut back on the heat and making it more child-friendly. If you have a crowd that really loves spicy foods, increase the amount of hot sauce and pass extra at the table. You can dial the heat up or down to suit your family and guests. And if you have kids who are reluctant to eat their vegetables, they will inhale this version! This appetizer is the perfect way to kick off any meal, adding a punch of spice and waking up everyone’s taste buds without being too filling or packed with calories. They are especially fun to serve when you have a gang over on game day. All the flavors people crave without the fat and fuss – and no bones to deal with! I cooked these on the grill by using a baking sheet and cooking them over the cooler side, but you could also make them on the stove or in the oven. Just be sure to keep an eye on the extra sauce in the pan – because of the sugar, it can burn if you don’t keep it moving. 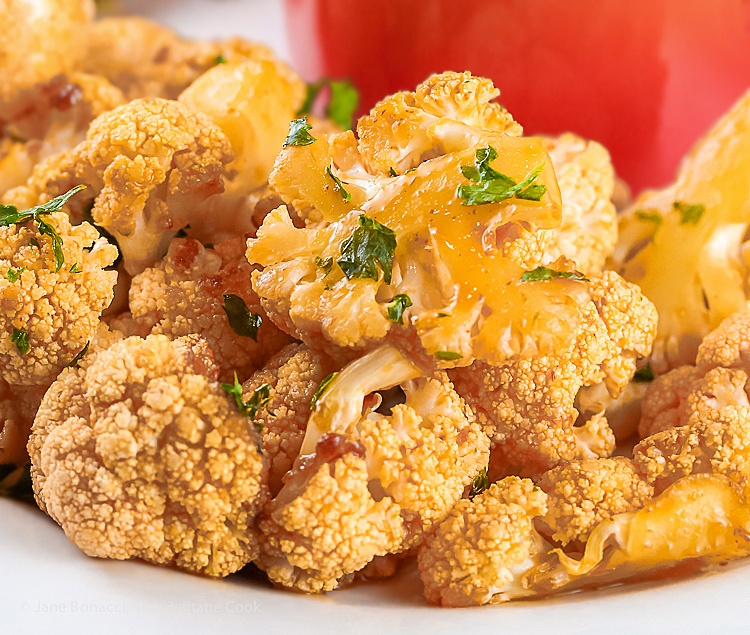 The trick with these is to cook the cauliflower just long enough to get a little tender, leaving enough crunch to make them easy to pick up and eat with your fingers. Or you can stick a toothpick into each piece to make them easier for your guests to keep their fingers clean. Either way they are delicious! Of course they wouldn’t be “true” Buffalo-style without some blue cheese to temper the heat. I have included a simple sauce where you melt the cheese before adding it to sour cream. It adds just the right amount of indulgence for this otherwise reasonably healthy appetizer. If you don’t want the sweet heat of this sauce, you can use a regular buffalo sauce in its place or just leave out the brown sugar. I like the counterpoint of sweet and spicy, so these are great for my palate, but make whatever is best for your family and friends. This dish is naturally gluten-free … the only part you have to watch out for is the hot sauce. Most varieties are naturally gluten-free, but it is always better to be safe than sorry so be sure to read the labels carefully. Make the Bleu Cheese Dipping Sauce: Place the cheese and milk in a microwave-safe bowl. Heat in 10-second bursts, stirring between each, until the cheese is melted. Whisk until smooth. Add the sour cream and black pepper, whisking until smooth and creamy. Taste and adjust seasonings. Pour into a serving bowl and sprinkle a few pieces of the cheese on the top if desired. If making this ahead, cove and refrigerate. Return to room temperature before serving. Prepare Buffalo Sauce: In a medium saucepan over low heat, melt the butter. Add the hot sauce, brown sugar, and lemon juice. Cook, whisking, until the sugar is fully dissolved. Taste and add more hot sauce or sugar if desired. Remove from the heat and let cool slightly while you prepare the cauliflower. Prep the Cauliflower Florets: Trim the leaves from the head of cauliflower and separate the florets, cutting them off the center stem. Cut any very large florets in half. Place the florets in a large mixing bowl. Pour about half the buffalo sauce over the top and toss to evenly coat. To Grill the Cauliflower: Preheat the grill over High heat to about 400°F. Turn the heat off the burner on one end of the grill, turn the burner next to it to low and the other burners to about medium-low. This helps the vegetables cook more gently. Brush a baking sheet (with sides) with vegetable oil. Pour the coated cauliflower florets onto the prepared baking sheet, spreading them out into a single layer, and place over the burner that was turned off. Close the lid and cook about 5 minutes. Use a spatula to turn the florets, scraping them if they are tending to stick a little. Cook until they are fork tender with a little resistance in the center, about 3 to 5 minutes longer. To Serve: Remove from the heat, toss with the remaining hot sauce mixture and transfer to the serving platter with the bowl of bleu cheese dipping sauce. Sprinkle some parsley over the top for color and a few crumbles of bleu cheese if desired. Serve warm. Today’s recipe is part of this month’s Pass It On Gluten Free, a gathering of gluten-free bloggers sharing our favorite recipes with you. This month’s theme is cauliflower, check out all of these amazing recipes utilizing this wonderful vegetable! Create a New Tradition Today! Welcome! If you ever need any entertaining or cooking advice, need to alter a recipe for gluten-free, or want recipe suggestions, don’t hesitate to ask. Unauthorized use, distribution, and/or duplication of proprietary material from The Heritage Cook without prior approval is prohibited. If you have any questions or would like permission, please contact me. The suggestions here are not intended as dietary advice or as a substitute for consulting a dietician, physician, or other medical professional. Please see the Disclaimers page for additional details. Thanks for visiting The Heritage Cook! I’ve never thought to grill items over a baking sheet. Genius! These look really yummy. I need to have a party just so I can make these! Any excuse for a party right! Happy to give you a reason, LOL. Enjoy! I hope you love them Alicia – you can dial back the heat or the sweet to suit your tastes. Enjoy!